Ha! Can you tell I got some money in my bank account today??? 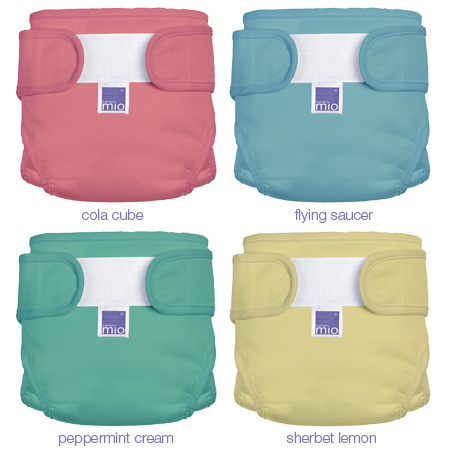 I have bought some new first size nappy covers to replace some of the older tatty ones we had, we opted against the MioSolo all-in-ones in the end as they aren't tumble drier safe and we NEED to get things wash and dried quickly in this family. I have bought more MioSoft covers though coz I simply LOVE the Bambino Mio brand, and some new nets to go in the nappy bucket. They should arrive in a couple of days. I've got a new Mio wet nappy bag too since we lost the old one on a trip out somewhere and it was a great thing to have with cloth nappies on days out. I have also found a couple of baby wraps / slings which work the same way as my beloved Moby wrap - but for a fraction of the price as they are not branded. I've ordered a red one and a purple one. I should always have a clean one now! And I have ordered some Raspberry Leaf Tea and Evening Primrose Oil to assist in getting my "bits" ready for this induction I'm going to be having at some point. I have no idea how much of what people say is true, but every little helps. I certainly had less drugs during, and fewer stitches after, the two births where I have used RLT & EPO. Since Bean is likely to be a whopper I'm going to give it another shot. I get my proper wages though at the end of the week. I might just have to splash out of that Moses basket cover & liner set I've pinned from eBay, and the mattresses for the cot & crib, and maybe even the bouncy chair.... Then we should be pretty much set for pre-baby purchases. Anything else can wait a few months after baby is here (mattress for cotbed, new cushion & cover for the high chair etc). All I'll have left to do is wash and sort the nappies and baby clothes! I am soooooooooo looking forward to getting my stash of baby clothes out again!